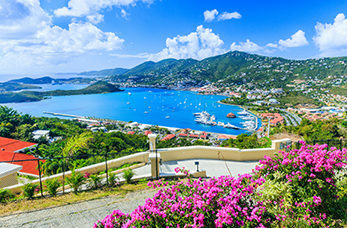 Charlotte Amalie is located on St Thomas and is not just the largest city but it's also the capital city of Virgin Islands, United States. The city is best known for its Danish architecture, building structure and history. The city is home to the largest Lutheran church in the Western Hemisphere, The Frederick Lutheran Church. The town has a long history of pirates, especially stories of Blackbeard. The castle was built in 1679 by the Danish as a watchtower to protect the harbour. The castle is located on the highest point on Government Hill. The castle was named Blackbeard after Blackbeard the pirate sailed the Caribbean Sea in the 18th century. To the eastside of hotel 1829 are the famous steep steps that lead to Government House. The bricks that were used to construct were brought over from Denmark in 1679, when construction started. This building is the home to the governor of the U.S Virgin Islands. The building commands a magnificent view of the local town and harbour. The Government House was built in 1867 as a meeting place for the Danish Colonial Council. This is the most historical building on the island and is the Western Hemisphere's second oldest synagogue. The original temple was built in 1796 but was destroyed in a fire in 1804. The temple that stands there today was constructed in 1833.